We take pride in treating children at our office. We believe your child’s smile should light up the room. Pediatric patients have different dentition than adults and may have specific dental and behavioral needs that are unique to a child. Children’s dental needs may range from preventative care to restorative needs, dental fluoride, sealants, or orthodontics. At Chalet Dental we focus on prevention through patient and parent education. We love kids, and we would love to serve as the dentist for your kids! The American Academy of Pediatrics and American Academy of Pediatric Dentistry both recommend that a child see a dentist within six months of the first tooth appearing. Most children usually get their first full set of 20 teeth by the age of three. Depending on your child and history, we recommend bringing in your child for a “happy visit”. 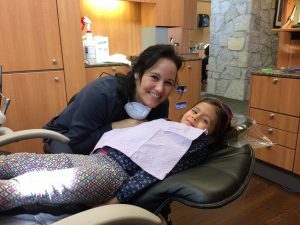 During this pediatric dentist visit, we like to introduce the child to the dental clinic and give them a ride in the dental chair. We will perform an oral screening, evaluate your child’s dental growth and development and risk for cavities. We will discuss oral hygiene instructions, feeding and dietary concerns and review information about oral habits and dental trauma. At this age, most of the children will lay on their parents’ lap for their examination. If cooperative, or as they get a little older, we will do a a complete dental and oral exam, cleaning and fluoride treatment. Dental x-rays will be taken based on your child’s age and needs. We will evaluate the health of your child’s gum tissue and check for cavities. We like to make every experience a positive one and build a relationship that will last through adolescence, between the dentist, the child and the parent. During the Happy Visit our dentist will be able to monitor growth and development as the child grows, and catch any problems while they are still small and easy to treat. Call our office today to schedule your child’s first visit to the dentist! We understand you want the very best dental care possible, and you should, you deserve that. Our entire Care Team works hard to deliver this to you every single day – and at a fair price. [See Our Promise] Our skilled dentists provide comprehensive dental care and precision cosmetic dentistry; serving residents of Roseville, Como Park, Highland Park, Little Canada, and surrounding St. Paul communities. Call (651) 964-3519 today to set an appointment.